Anyone who loves birds can get a deeper insight into their intricate beauty by taking time to observe and draw them. Having a better understanding of these small, but complex creatures enhances any birdwatching. Birds are a favorite subject of artists everywhere, as they represent freedom and cheerfulness. 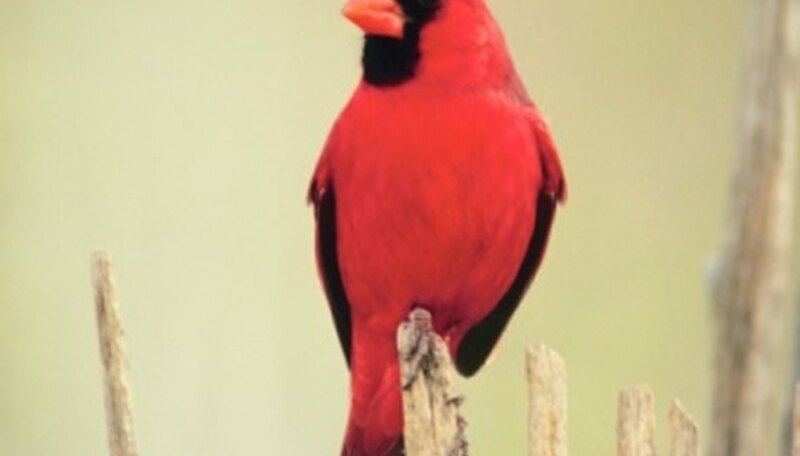 Cardinals are known for their beautiful red bodies and black masks. Learning to draw birds such as cardinals is a fun, wonderful way to enhance the ability to observe detail. Starting with the very basic shapes is fundamental, refining and developing the drawing's fine detail as you progress. Draw a circle for the cardinal’s head. The first step is to lay in very basic shapes and lines. Add a line from slightly inside the circle, about halfway down, extending out to the left of the head slightly, as if the bird is looking to the left. This represents the beak. Draw the cardinal’s body. Think of the shape of a banana with both ends cut off and rounded, curving to the left. Make the body approximately three lengths of the head, tapering off at the bottom and starting the body slightly behind the head, so the head appears attached to the body. Sketch the tail feather outline at the bottom of the body in a rectangular shape approximately three-quarters of the head width and two head lengths. Extend a 45-degree line, approximately one head length, from the right side of the body just above the tail feather portion to represent the leg. Sketch the shape of the bird’s head. Using the circle as the base, refine the head, adding a small jagged top notch to the head that slants slightly backward. Draw a sideways “V” shape with slightly curved lines, beginning at the outside end of the beak line to inside the head, extending in about one-fifth of the circle diameter. You are creating the beak. Draw a round eye in direct line with and slightly back from the center beak line. Develop the wing by extending a line down the backside edge of the body from the bottom of the head about two head lengths. Now, extend a curved line up from that point, to slightly under the head. Make the wing width approximately one-quarter of the body width. Color the eye, using black paint. Leave a tiny white speck in the top of the eyeball to indicate reflected light, giving the feeling of life. Add several downward stroke layers of feather lines in the wing and tail. Fill out the leg, slightly more where it meets the body, and create feet by adding three forward- and one backward-facing curved, clawlike shapes. Paint the cardinal body a bright red, and the tail, wing, feathery top notch and area around and under the beak black with faint touches of red. Roughly sketch a branch, either horizontally under the cardinal or vertically, as if the bird is standing on the side of an upward-facing branch. Observe any tree for guidance in drawing the branch. Make the bird, not the branch, your focal point.